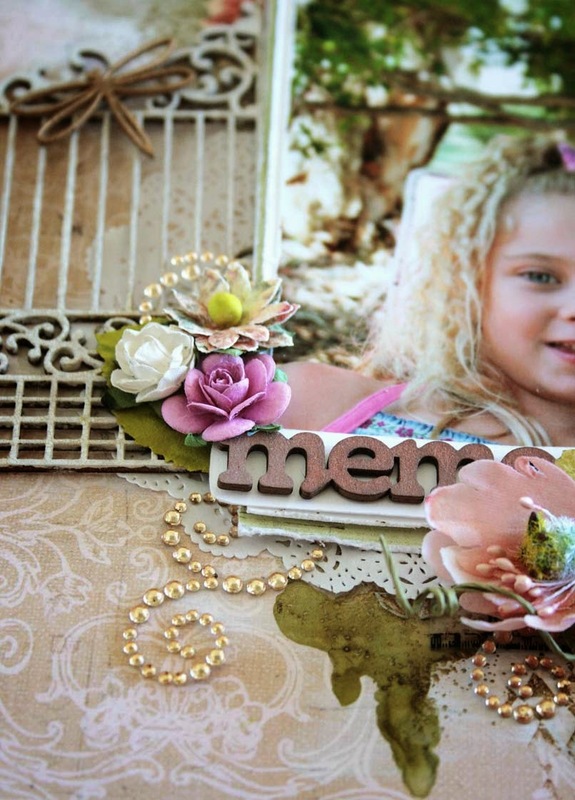 My 'Memories' layout was published recently in Scrapbooking Memories magazine, and I'm happy to be able to share it here on my blog with you today. I took a mixed media class earlier this year and shortly after wanted to try out a few techniques. One of the things we learned in the class was that with mixed media there are no mistakes, just add a layer of gesso and keep going. This layout was my first 'play' after that class. I had decided that one of the masks I wanted to use was the brick wall mask, and I figured I'd mix some brown acrylic paint with my texture paste to pre-colour the paste. You know, brick wall... brown... ugh. Yep, as soon as I'd put it down I knew I'd made a mistake and was so close to binning the page, but that lesson we learned about a layer of gesso and keep going? I figured it was worth a try. So I added that coat of gesso and pulled out a pot of Twinkling H2Os in Mustard Green that worked well with the background of my photo, and got to work. And guess what? 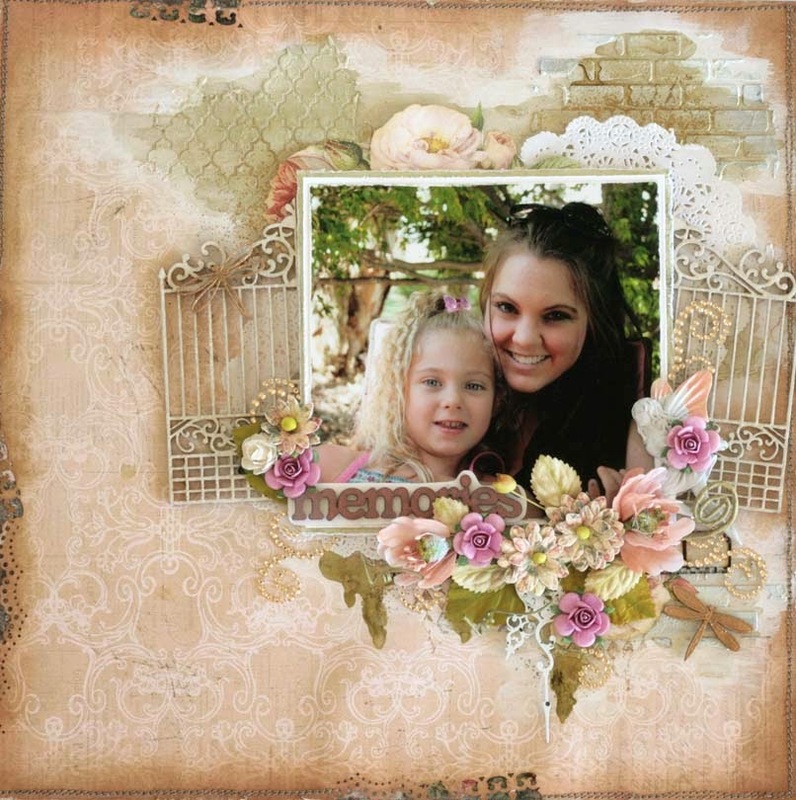 My page was saved and I learned my mixed media lesson - just add another layer. 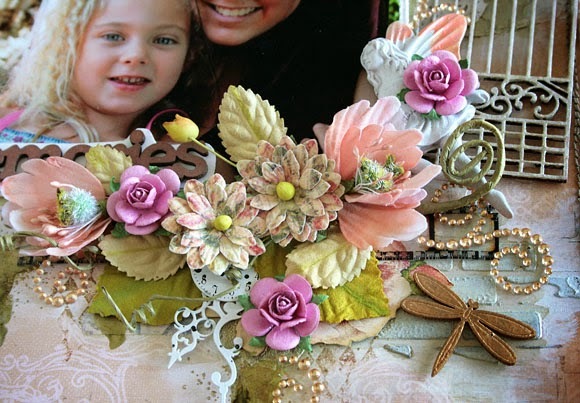 I've created a large cluster made up of flowers, a clock face, some Tim Holtz film strip, and even a Prima resin fairy below my photo. Here you can see where I've pooled my Twinkling H2Os and let them dribble down the page a little. And of course some bling to finish it off. 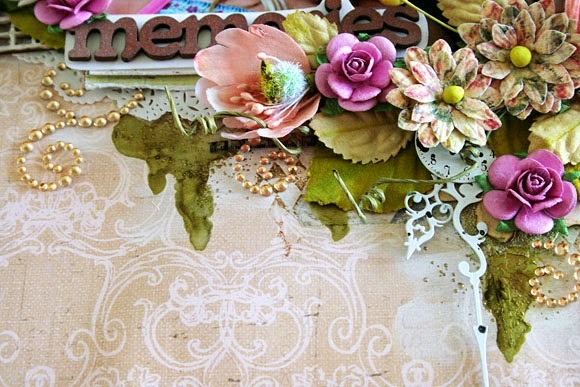 My hot tip published in the magazine was to use two different edge punches on random sections of your border for a grungy look that can still work on a feminine layout. Products Used - Prima Marketing Inc patterned paper; Martha Stewart punches; Kaisercraft stamp; Prima Marketing Inc flowers, resin, crystal flourishes, chalk ink; Tim Holtz film strip and Distress Ink; Heidi Swapp stencil & Colour Shine; chipboard; Kaisercraft wood veneer; Manor House Creations leaves; Twiddleybitz stencil, doilies, washi tape, thread, Ranger archival ink, Luminarte Twinkling H2Os, Tattered Angels Glimmer Mist, crackle medium, Windsor & Newton iridescent medium, texture paste, gesso.